I am sorry to say that it comes as no surprise to me that my first post as a newlywed is one born of bitterness. And though I've heard that is a natural turn of events after marriage, the sour taste in my mouth is not from marital strife–though I have questioned my husband's intelligence multiple times today and it is not yet noon (see following pictures). No, it is the Minnesota weather that is the subject of this diatribe. More specifically the winter and the 2.5 feet of snow I spent 2.5 hours shoveling this morning. I'm not going to rant on too much about everything I hate about Minnesota weather. I'll let the pictures speak for themselves. Suffice it to say, I am beginning to understand why people here are either carrying some extra pounds or orange from tanning beds (seriously, they're orange. I call it Minnesota tan. I haven't yet figured out whether they think they're fooling people or they just think mistakenly think oompa loompas represent a "healthy, fresh-from-the-beach, flattering glow." Half the population here looks like they've got advanced jaundice). #1: Christmas decorations are rendered almost completely pointless in the span of 8 hours. There's our star, sticking irritably out of the snow where it must have fallen at some point. Can you see the Christmas lights I wound around the porch. No? That is because you are blinded by the ridiculous amount of snow between the camera and the porch. 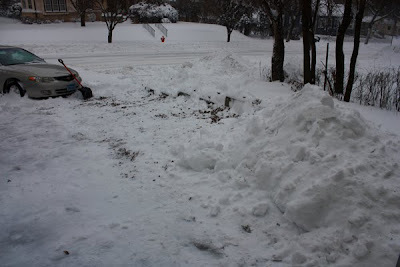 #2: Minnesota has transformed snow from a magical event that involves laughter, sledding and hot chocolate to a miserable event that involves copious shoveling, repetitive stress injuries and instant dreadlocks from the completely stupid strong gusts of wind. Above, you can see I have completed 1/3 of the driveway. What's that in the background? Oh, it's my husband's car. Stuck. In 2 feet of snow. Let's move on to that, shall we? #3: Minnesota has done something to me and Philip. I notice in myself a newfound cynicism and bitterness (you don't say). I think this is because the weather forces me to spend so much time indoors. I'm like a plant and thrive in sunny, warm climes where I can spend time outdoors, open the windows, even sweat. Gray, cold places like Minnesota used to make me sad and wilted. Now they just piss me off. Of course if you ask me if I'd rather be sad or angry, I'd pick angry. I get a lot more done angry than sad. As for Philip, his common sense and perception seems to completely disappear in the Winter. He owns a hat, a coat and boots and yet he WALKS to work in 12 degree weather wearing just his suit and dress shoes. His hat, coat and boots remain in the closet. In fact, he has never, EVER worn the super warm cashmere coat his parents got him four years ago. Not even once. Philip refuses to acquiesce to the Winter. I'm not sure why. If he is not in danger of instantaneous frostbite, he wears his flip flops. He has become one of the obstinate patients he complains about the most: the ones who just won't see what is right in front of them. 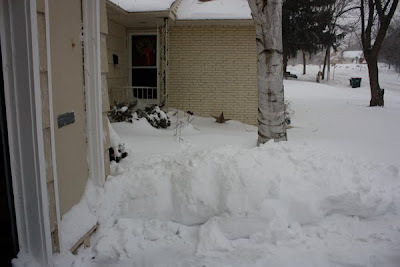 Which brings us to this morning, when he ran headlong right into what was in front of him: 2.5 feet of deep, cold snow. #4. So you see the two photos above. 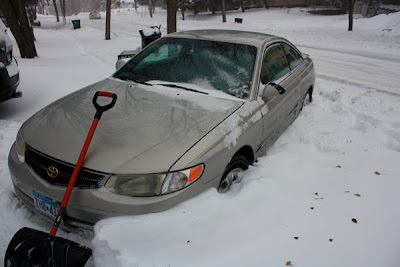 I took those photos of my progress as I dug Philip's car out of the snow. You can see that the car is a pretty busted '98 Toyota Solara. It has 120,000+ miles on it, a defroster that won't work and a rusting left-hand side that got swiped by a drunk driver. On the inside if you lower the visor, the vanity mirror falls out and hits you on the head. The seats jiggle so much that I'm convinced that if we had a wreck, we'd be shot like projectiles, seat and seatbelt straight through the window. Despite all of that, Philip seems to be under the impression that his car is a Humvee. And he treats it as such. 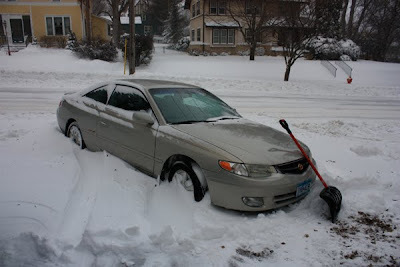 This morning he opened the garage door and, without taking so much as a second to look behind him, promptly drove 6 feet backwards, packing the snow nice and tight in the undercarriage before finally marooning his poor dinghy of a car on a vast island of snow. (Philip apparently has a few issues with glancing behind him before exiting a garage, having previously driven entirely through a garage door on the way to a hot date). At that point, guess what he did. HE WALKED TO WORK IN A BLIZZARD IN HIS SUIT AND DRESS SHOES. His coat, hat and boots were a mere 10 feet away inside. THEN HE CALLED ME TO TELL ME HOW COLD HE WAS AND HOW WET HIS SUIT AND SHOES WERE FROM WALKING IN KNEE DEEP SNOW DURING A BLIZZARD. Do you know how much sympathy I had for him? I'll bet you can guess. #5: This weather ruins all kinds of things, not just moods. 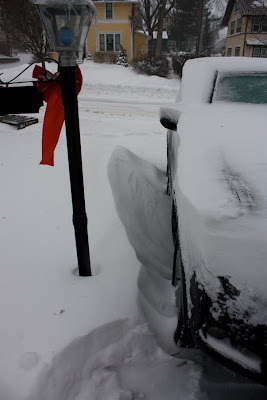 Above is my snow-covered car (we only have a one-car garage, so Philip's elderly, ailing car gets it). Once I brushed all the snow off, I discovered a very impressive crack in the windshield that stretched the entire length. Yay! 6. 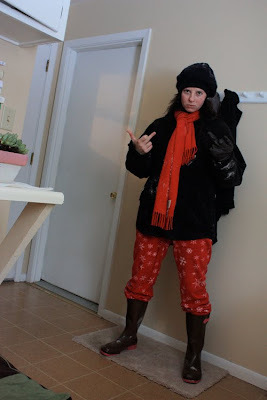 Topped with a fleece pullover, a fleece jacket, a fleece scarf, my dead granny's black beret, a look of bitter scorn, a pair of leather effing gloves and my fingers pointedly posed to show exactly how I feel about spending the morning shoveling snow. #7. 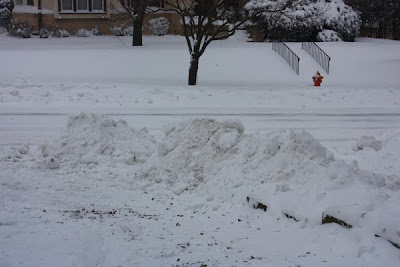 I watched many a snowplow drive by and ignore me as I struggled in the snow. I thought: "Well fine. If not me, who else is going to do it?" Twenty minutes after I got inside, Philip called and said our landlord would be over tonight and tomorrow to shovel snow. I might cry. Tears of joy. Tears of anger. But definitely tears. Remember going to camp when you were little and getting homesick and writing letters begging your parents to come get you? Please come pick me up. It's miserable here. I got here from Kristen's blog. But, I must say, you've struck a chord. I'm a fellow Southerner who got transplanted into the Midwest as well, and I could not agree more about the snow! I will have to share this post with my husband--who I'm sure will find it funny as we say the same things daily! You need to get some North Face Down. It will change your life! BTW, your husband is a surgery resident? Mine is a 3 year medical student. He would be graduating this year, but he took an extra year to do a master's degree as well. Crazy.